We (MF Twins and our elder sister, Faryal) were introduced to glass painting by our cousin living in Pakistan in the year 1998. We saw a mirror painted by her and some glass frames. The art interested us greatly because the final look was beautiful and the black outline was eye catching. A few months later we bought some glass paints, outliners and framed glass to begin experimenting. In each other’s company, which was a source of constant inspiration and appraisal, we made painted. Our motifs and designs were our own and all three of us used colour combinations that pleased the eye. We all worked individually and made numerous glass pieces. It was lovely when our mother joined us in painting. As we achieved perfection in the outlining, no lumps or breaks, the idea of presenting our work to the world germinated. As a result, we participated, for the very first time, in the Winter Bazaar organised by Dubai International Art Centre. With around 500 pieces to display, excitement was immense. We had contacted a local newspaper requesting them to publish an article about our work with information of the bazaar. 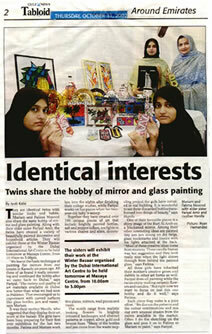 On October 31, 2002 the article came in Tabloid by Gulf News introducing our work to the world. The bazaar took place the following day and there we met success! We realised the difference between our work and other glass painters (also present at the bazaar) was that we used rounded pieces of glass which could later on be used in day to day life. Our speciality was vases, jewellery boxes, plates, candle holders, drinking glasses, bottles and jars. We got an overwhelming response which encouraged us to make more art pieces. Years passed and we participated in almost 21 bazaars conducted in the cities of Abu Dhabi and Dubai. We also designed courses to teach ladies and children how to do glass painting. After passing on the art to others, we felt it was time to move on in life. In 2004 we left painting. Still when we pass by any beautiful glass piece in a shop, there is a silent desire of painting it!